Free the Children's We Day came to MN for the first time on Oct. 8, 2013. I was SO honored to be a big part of this event. It is a volunteer take-action movement of an entire generation. We Day is an event to recognize and thank teens who have taken action on issues important to them, and to spark their interest to take more action. Their philosophy is that everyone can make a difference, even young children and young teens. In fact, Free the Children's founder, Craig Kielburger, was just 12 years old when he and his older brother first took action and formed his first group. You can't buy a ticket to We Day--you have to earn it--by doing at least one local and one global community service project. 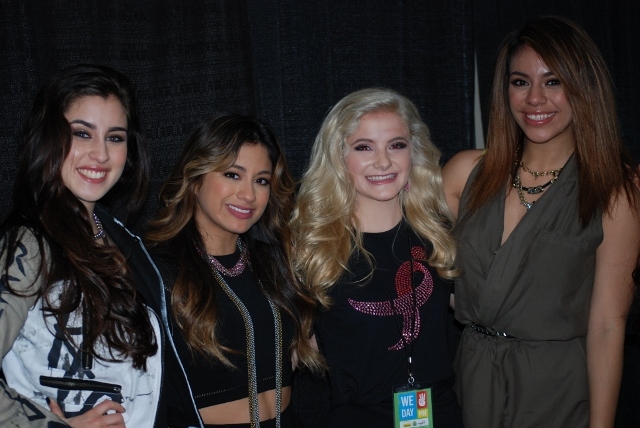 The event was held at the Excel Center in St. Paul, and there were over 19,000 teens in the audience. It was also live-streamed worldwide. Yoplait/General Mills was a major sponsor of the 2013 We Day event. They are also a major sponsor of Susan G. Komen, having donated over $35 million to Komen. Yoplait asked Komen MN to select a teen who has been especially involved in making a difference as a volunteer with Komen and Breast Cancer Awareness. I was so honored when I got the call from the Komen staff that they had selected ME to represent them on stage at the event. I was even more honored and excited when I found out that I not only would be recognized on stage, but that I had been selected as one of their Keynote Speakers for the event. I had never even heard of We Day before I got the call from Komen, so I had no idea of the magnitude or the significance of the event. Being a speaker for the event was truly the greatest honor I've ever received, and it was the BEST DAY of my LIFE! I was even more honored when the Yoplait staff shared their We Day initiative that they wanted me to talk about in my speech. They told me that I was the inspiration behind their initiative, which is Gift + Issue = Hope for Change. They told me it was because I've had a history of using my gifts, pairing them with the issues I care about, to create hope for change. They wanted ME to encourage other teens to do the same. That was the biggest honor of my life so far! Though I had given speeches before, it was my first time speaking live on stage in front of 19,000 people! Barbara Pierce-Bush, our former President's daughter, spoke just before me. 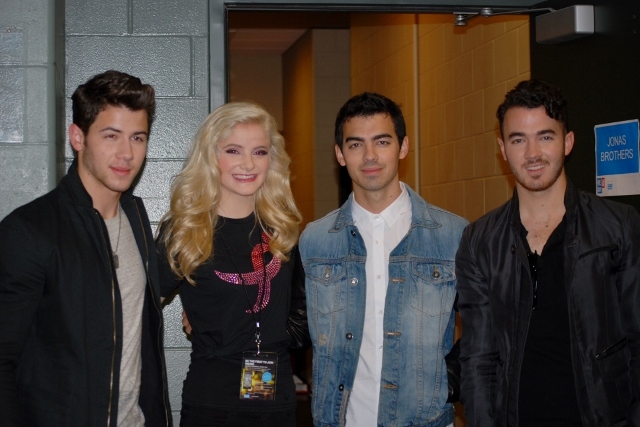 I was then introduced on stage by Disney star, Bidget Mendler, and I was followed on stage by The Jonas Brothers for what ended up being their last performance together before they split up the next day. I was honored to meet so many people who are making a difference, including Martin Luther King III, Disney star Debbie Ryan, Carley Rae Jepsen, and one of my favorite groups, Fifth Harmony! But the best was seeing the founders of Free the Children, Craig and Marc Kielburger, who are awe-inspiring! They not only started Free the Children as young teens, but they grew it into the most powerful youth-centered volunteer group, and one that helps causes all over the world, especially children's causes. It's children/youth reaching out and helping other children/youth. When Craig was only 12, he was horrified by reading about the treatment and even murder, of children in other countries, like those who were forced to work in sweat-labor jobs. That's where the name 'Free the Children' arose, because it was his hope to take action and free the children. Free the Children now offers youth leadership camps as well as many overseas volunteer take-action opportunities in areas where children need the most assistance. These are not the typical 'tour groups' that pretend to be volunteerism trips. Instead, these are trips where the youth volunteers jump in and do REAL work to make a difference. I'm hoping to be able to volunteer at one of these trips next summer or the summer after. I was so excited to also speak at one of their Youth Leadership events in Minneapolis. At the 2013 event, I was either on stage or busy back stage most of the day, so I didn't get to watch much of it. But in 2014, I was so excited that my AP Human Geography teacher selected me to be one of the 25 teens from my school to attend the 2014 event. I was also honored that she selected me to attend the service day and events at the Nobel Peace Forum that year, where I was able to hear former President Jimmy Carter give a speech. My We Day speech is below the photos. I have to give a disclaimer - I had my speech completely memorized, and at the rehearsal the day before the speech was to be delivered, I learned that they rewrote my speech but had forgotten to send it to me, so I had only a few hours to learn all of the changes in the new speech. Unfortunately, I forgot one of the words of the new rendition - which was a very embarrassing moment for me that you'll see - but I kept on going! I hope you enjoy my speech, and that perhaps it will challenge you to think about what YOUR gifts are, and how you might pair them to take action on the issues you care about, so that you, too, can create hope for change! Above: With Martin Luther King III. I'm in awe of all of the work his father did in advancing equality and civil rights, and I'm glad to see that his important work is being continued. Above: Just before I was about to go on stage. The Jonas Brothers performed right after me, and it was their last performance before they split up the next day. Below: Disney star, Debbie Ryan, left a huge impression on me. She not only sought ME out, but she introduced herself and told me she had read my bio and that she was really impressed with all of the volunteer work I've done. I was pretty surprised that someone as well-known as her would actually take the time to read about me AND come over to talk with me! 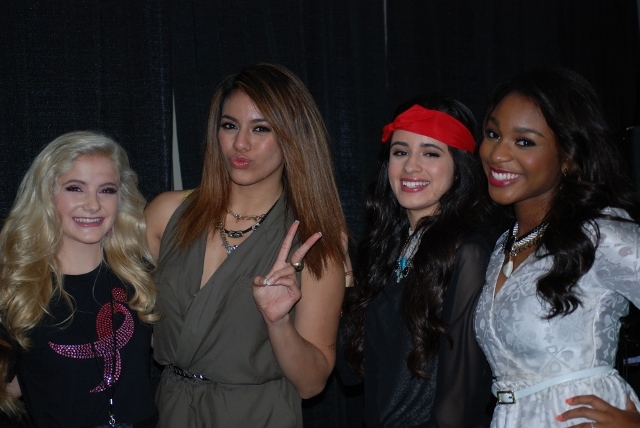 Above: With the Fifth Harmony members. They are not only one of my favorite groups, but they were also SO NICE!!! They were all so welcoming, and twhen they later ran into me in the hallway, they even remembered my name!